The Four Seasons in Austin requires guests to opt-in for newspapers. This picture should send shivers down the spines of executives at USA Today headquarters in McLean, Va.
For at least as long as I’ve been traveling for business (13 years and counting), a USA Today in front of the hotel room door in the morning has been a given. It just shows up. There’s fine print in the check in folder that says that USA Today will be delivered and if I don’t want it, I can tell the front desk and get a credit of 75 cents a day. Because I do what most people do — nothing — USA Today gets to count me as paid circulation. At least 60% of the time, the only people who see that USA Today are the person who drops it off in front of my room and the maid who throws it away. I’ve already gotten my news from my laptop and from the TV that was showing CNN while I was getting ready. I’m surely not the only one, and hotels are catching on. Hotels have been steadily greening their practices while cutting costs: changing sheets only between guests, changing towels only when guests leave them on the floor, providing new toiletries only when guests have used up the previous batch. Cutting back on newspaper delivery is the next step. This year I’ve started encountering hotels that ask me at check in whether I want a newspaper. 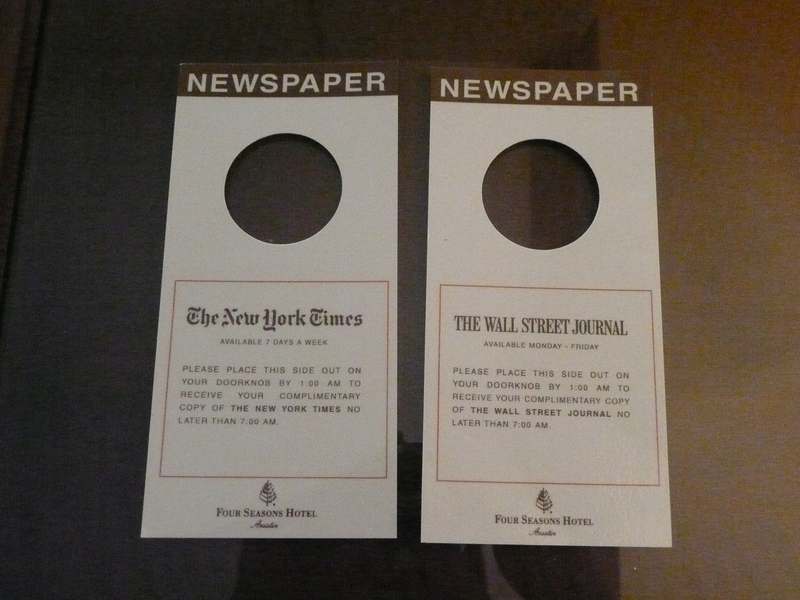 The Four Seasons in Austin has gone a step further: if you want a newspaper, you have to put a hang tag on your door before 1 a.m. And you have to remember to do this every night of your stay. As with Web defaults, you can guess what happens. Most people do what I do: nothing. On my floor early Sunday morning, I saw three newspaper hang tags (out of about 40 rooms). Not even a free copy of the Sunday New York Times enticed people. They were easily outnumbered by the “do not disturb” hang tags. There are a number of unknowns: how many rooms were occupied, do the hotel’s demographics shift considerably during SXSW, etc. But the fact that an increasing number of hotels no longer consider newspapers an essential part of their service is bad news for the newspaper industry. See also: Who needs newspapers? This entry was posted in hotels, journalism, media, newspapers, travel. Bookmark the permalink.